…with the Stray bar and restaurant on site for your convenience. 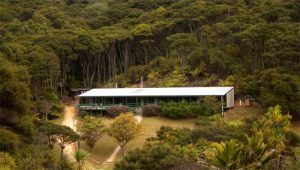 Set in 30 acres of native bush with views of the harbor from the restaurant and its large outdoor deck we provide an affordable escape from the ‘rat race’ and a friendly accommodation stopover for travelers from around the world. Like all facilities on ‘the Barrier’ we are self-sufficient to a large degree, providing our own power from a hybrid generator/inverter and battery system and drawing water from a bore on the premises, which is tested by Auckland City Council several times a year. Hot water is provided by either wood burning heat exchanger or gas caliphont. We provide full self-catering facilities for all backpacker, self-contained and camping guests, or you can eat in the restaurant and bar if you choose. Our camping area is in a sheltered valley close to all other facilities. Visitors are encouraged to respect the difficulties involved in living here by conserving power and water and to enjoy the Great Barrier Island’s natural and unspoilt beauty while keeping in mind the fragility of the local ecosystem.